» Baby Poop Brown: Christmas Tree Woes and Social Media Savvy! Baby Poop Brown: Christmas Tree Woes and Social Media Savvy! My Christmas Tree is Baby Poop Brown: in daylight! 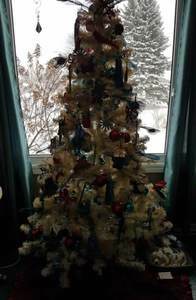 A couple of years ago my son bought me a beautiful white Christmas tree. I loved it. I got red and turquoise decorations to make it jazzy. 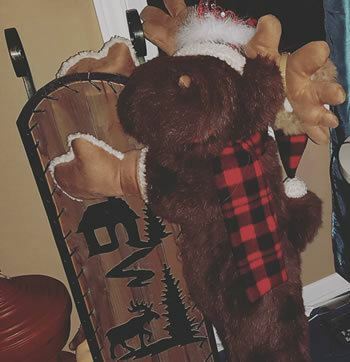 It gives me joy, just like Herbert, the 3-foot moose with a sleigh, currently in my living room. 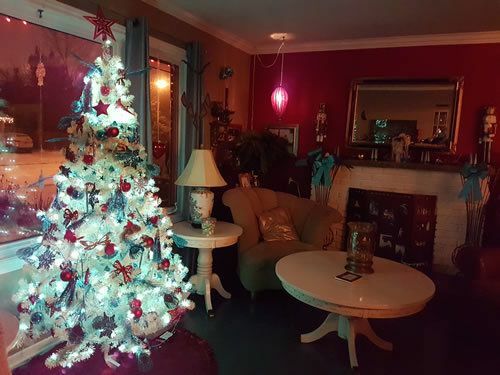 This year when hubby and I hauled out the mounds of Christmas stuff – okay, I’m an artist, right? I like decorating. It’s a thing. Anyway, this year we got out the tree, and it had turned color. I have grandchildren. I recognize the color. I have seen it inside huggies and pampers both. Not quite mustard. Not tan. Even girls don’t have a label for this color, we just call it baby poop. Being me, I promptly took pictures to post and here I am, sharing, cause y’know – Social Media. I know I’ll be reading stories about shopping drama – what is the hot toy (Hatchimals) that everyone is scrambling for this year? – and the dinner substitutions – it’s an annual tradition to forget something at the supermarket. We’ve got a gluten-free requirement we’re still getting used to so I’ll be watching for great ideas and I know I’ll find them, because people figure these things out and they share. I saw a post from a guy who now has 14 left gloves because he keeps losing only the right one – well, I laugh and I’m glad I don’t have that tradition. Photos of grandkids in their Christmas finest will be interspersed with comments (and whining) about the shopping nightmares and the rush to get organized for IRL events. Amongst the stories and the smiles a barrage of holiday greetings and memes flood the cyber-waves. What are your best practices for your business for holiday blogs and posts? Everything you do online affects your digital footprint in the marketplace. Every image of a reindeer with lights in its antlers and every meme that says enjoy the season is contributing to your brand, your presence and the impression you give people about you and your company. Yes, I know, you just want to say Merry Christmas, right? Well – do you? Or do you want to say Happy Holidays? What about Happy Hanukkah? Do you want to be exclusive or inclusive in your interactions? The true value of Social Media is in engagement and becoming a real person to your contacts: people prefer to do business with People they Know, Like and Trust. (PKLT) Will your company acknowledge Secretary’s Day with a thank you to the admins who keep us sane? Will you post tree-hugger memes on Arbor Day? It’s simple and fun to share a great meme that shows a New Year’s glass of bubbly. It’s cute, why wouldn’t you share that? Well, that depends… if your company is a taxi service, posts with alcohol could be a great way to suggest your service as a wise way to attend holiday events – make sure you are clear that it’s your customers who are indulging! Bad Santa 2 movie NOT for Kids! Before you share that you’re going to see the new Bad Santa movie, pause and consider that your client’s children may be on this social platform too, and they won’t thank you if they have to explain. Pause a moment and decide how you will portray you and your company, and then keep that decision in mind every time you post, share or comment. You are the face of your business online. Decide now, so you won’t have to hesitate and you can enjoy engaging. Make it simple for yourself! Even if you’re the sales guy who takes your customers out for a night on the town, you have to keep your professional image in mind. Well, okay, you don’t, but you may regret that the next day. 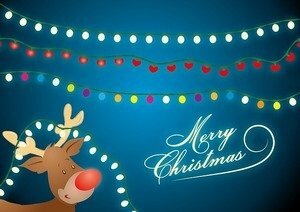 Every holiday is an opportunity to build relationships and to build your online presence: what is your message? Who are you? Tell the world with deliberation and intent: Hark! Happy Holidays!